'Clintonomics' Ruled The 1990s; 'Hillarynomics' Would Be Different : It's All Politics The name "Clinton" remains magic for many Americans who got jobs, bought homes and invested savings in the 1990s. But key elements of "Clintonomics" may not be popular with today's Democratic voters. 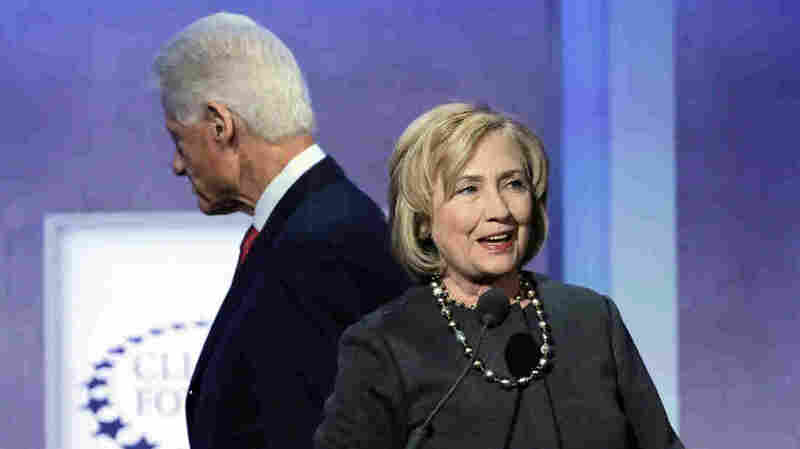 Hillary Clinton begins to speak as her husband, former President Bill Clinton, moves to take a seat after introducing her at the Clinton Global Initiative on Sept. 22, 2014, in New York. If you are under 30, this may be hard to imagine, but in the late 1990s, the economy was a job-generating machine. In 2000, the final year of Bill Clinton's presidency, the unemployment rate fell as low as 3.8 percent. Then, within a decade of his White House departure, the rate was up to 10 percent. Those two numbers explain why the name "Clinton" remains magic for many. People who got jobs, bought homes and invested money two decades ago associate "Clintonomics" with good times. On Sunday, Bill's wife, Hillary Clinton, announced that she wants to make 1600 Pennsylvania Ave. her home address again "so you can do more than just get by, you can get ahead and stay ahead." But to boost prosperity, can Hillary Clinton use the same formula as Bill? Or would his policies turn off today's Democratic voters? Before considering all of that, let's look back at the context and key elements of Clintonomics. In the summer of 1992, when Bill Clinton was running for the presidency, the unemployment rate was a painful 7.8 percent. Famously, Clinton's strategist James Carville came up with the campaign's de facto slogan, "It's the economy, stupid." Starting in 1993, after Clinton took office, the economy turned around. During his second term, real economic growth averaged a robust 4.5 percent per year. Unemployment tumbled. Also in that second term, the government started running budget surpluses. "Job prospects are terrific. Unemployment is lower than it's been in nearly a quarter century. Business sales and profits are growing handsomely. Inflation has almost disappeared. The financial markets are booming. The U.S. is the world's preeminent industrial power and — even more important — the unchallenged leader of the technological revolutions of our age." To reduce budget deficits, Clinton pushed for and won higher taxes on upper-income taxpayers, but at the same time, expanded the Earned Income Tax Credit for low-income workers. To restrain spending, he adhered to a tight system of offsets, which allowed some tax cuts but only when balanced by spending cuts or increases in other taxes. To shift people from welfare to work, he signed a welfare reform bill, but also won an expansion of Head Start and other programs for the poor. To boost trade, he signed the North American Free Trade Agreement, and to help displaced workers, he established the NAFTA-Transitional Adjustment Assistance Program. To spur lending and investment, he signed legislation reducing financial regulations. To reform agricultural subsidies, he signed the "Freedom to Farm Act." Many Republicans argue that Bill Clinton was simply lucky to be in office when oil prices were falling, global trade was expanding and the Internet was suddenly bursting forth, creating job and investment opportunities. Also, demographic forces were positive. That is, baby boomers were in their peak earning years and spending heavily on houses, SUVs and goods for their children, now known as millennials. And they argue that it was House Republicans, such as Newt Gingrich and John Kasich, who pushed for reforms that led to lower deficits and welfare spending. Hillary Clinton has not yet spelled out her economic approach. In her videotaped announcement, she said only that "Americans have fought their way back from tough economic times, but the deck is still stacked in favor of those at the top." But with her video's emphasis on working parents, she appeared to be suggesting she would emphasize reform issues promoted by liberals, involving: child care, paid sick leave, maternal and paternal leave policies, student debt, worker scheduling reforms, a higher minimum wage and tax policies that penalize second earners. Trade will be a tricky issue for her. Bill Clinton was a strong supporter of NAFTA, but unions are fighting legislation that would make it easier to approve similar trade deals. Financial deregulation, which her husband supported, may be another difficult issue for the former senator from New York. Minutes after she declared her candidacy, AFL-CIO President Richard Trumka issued a statement making it clear what unions, a vital Democratic constituency, want from this Clinton. It's time, he said, to focus on the "urgent need to raise wages in America, and an equally urgent need to reject corporate-driven agendas that produce everything from tax breaks for the wealthy to destructive trade agreements."